Everyone have a safe and happy New Year's Eve ! 2008 is coming to a close... I wonder what kind of money the December totals will bring? Stay tuned, I'll tally 'em up New Year's Day... or thereabouts. Here's an interesting gee-tar to start the days listings off with, a 1296, available in the very last days of Silvertone-branded instruments. 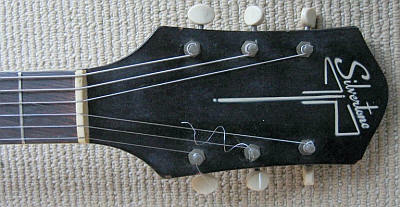 The decades-old '6XX' model number pattern for Sears acoustic guitars changed in Fall/Winter 1968 to a '12XX' pattern. 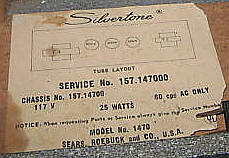 The 1296 came along so close to the end of the Silvertone-as-a-brand run, that it doesn't appear in any seasonal catalog! The guitar resembles the popular 604 that Sears sold so many of (last seen in S/S '68, it became the 1204 in F/W '68 and was gone by the following fall), and seems to be the indirect predecessor of the 1294 that appeared in late 1970. 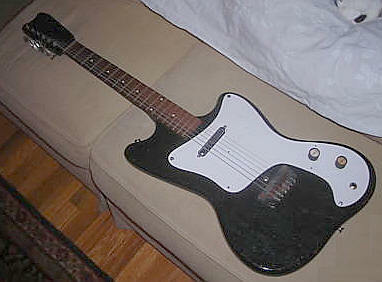 Let's start today off with a fairly uncommon guitar, and my favorite Dano-built Silvertone: the solidbody 1451. Will ya look at THIS?!? I believe it came from the Sears, Roebuck on MARS! Unique logo tag, no makers mark or model number, at least it says "Made In Japan" on back of the head. Any ideas? 615 Harmony FTAC VG $22 Clean, minimal wear, bridge has been glued in place, serial #1999H615, Deal of the Day! 1423 Harmony SSEG w/ OC VG $606 All knobs present, plastic protector included, very clean, receipt included! 1417 Dano SSEG G $540 BO NS knobs, NS access cover, playing wear on lower bass bout, looks like a headstock crack/repair, logo intact, buckle rash, neck sanded smooth. Unusual instrument: 1417 was the model designation for the earliest (debuting in the Fall/Winter 1959 catalog) bronze 'dolphin nose' Dano-made U bodied Silvertones, but a dual pickup version was never offered in any seasonal catalog. Was this a late model 1301 with a dolphin headstock (Dual pickup bronze, pre-F/W '59, but pictured in catalogs with the 'Coke bottle' headstock), or a custom-ordered 1417? 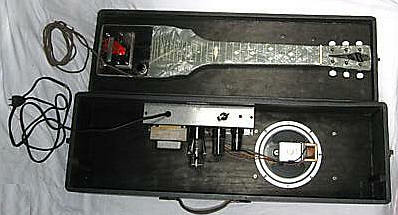 Or, maybe a cobbled together guitar from parts? Id' really like to know the potentiometer codes versus the neck stamp. 605 Harmony FTAC w/ OC VG $99 BIN Clean, larger soundhole model that was available from 1948-1957 on this popular model. Also features the unusual yellow headstock logo. Fish out your Chuck Berry or Beatles or ELO albums and give "Roll Over Beethoven" a spin to celebrate Ludwig Van's birthday today! 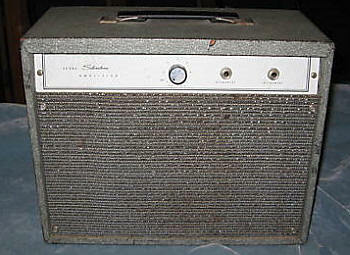 A lot of great instruments and amps sold over the weekend, but to me the real story was the fine acoustics, electrics and amps with reasonable prices that DIDN'T sell (or even get BID on)... so, all you secret Silvertone Santas out there, it's a great time to buy! Next, let's talk a little about this Dano-made so-called U1. That translates to the 'U' designated body shape, and 1 pickup. This one is unusual in that it is a custom color (officially only offered on the 'C' series guitars; model #1358 & #1360), and the wider U shaped body (13.25" width versus 11.25" for the 'C' shaped bodies). There was quite a bit of discussion attached to this sale as to whether this was an original finish, really a Silvertone at all or sold through another vendor entirely. 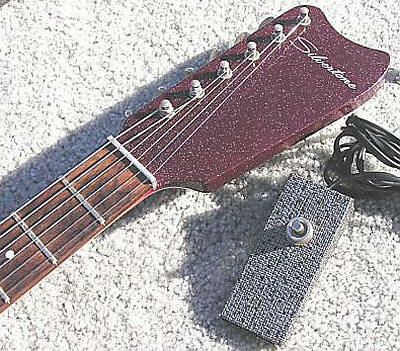 I enhanced the contrast and overlaid a Silvertone logo from a 1304 headstock onto the image of the headstock of the red guitar. 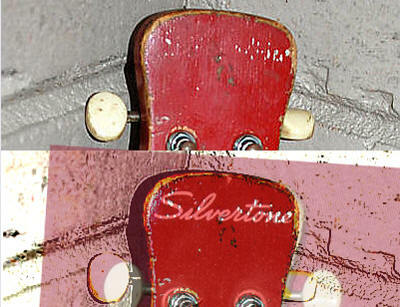 You can see where the flecks of white paint that are left exactly match the thick script Silvertone logo. As we've seen, Sears would go to great lengths to satisfy customers, and I'm sure that it was little skin off Dano's teeth to 'shoot' this guitar in red rather than black or copper. According to Peanuts' Schroeder, tomorrow is Beethoven's birthday. Well, roll over, Ludwig, the holidays are comin' like a freight train. 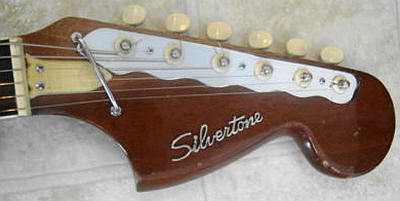 I hope Santa has got a a Silvertone on your Christmas list. If not, ebay is there to help... I've seen a bunch of bargains lately, and you just might find what you've been hankerin' for. 1484 Dano tube amp only F $210 Edge and corner wear, partially re-capped and cord modded, but project dropped mid-phase, break out your soldering iron and schematics! 1457 Dano SSEG with tube amp in case VG $435 Very clean, no wear to speak of, couple of NS tubes, no footswitch, adhesive bleed discolor on amp knobs, DEAL OF THE DAY! 1482 Dano tube amp VG $276 Very clean, square spkr. cutout, footswitch incl. 831 Ukelele VG $70 BO Skier design , light crazing, plastic fretboard, original box incl. Here's an oddball; it's a 608, looks just like the 604, but internally stamped 'N-1' so it's made by Kay, and has the typical Kay peaked headstock. Crazy! These were available late 50s to early '61, after which they became the more common Harmony-made 604. Save for the high-peaked headstock and a little better definition on the faux 'tiger stripes (Harmony edges were a little fuzzier),' they look identical. Two weeks from today, we'll be putting bags of crumpled wrapping paper out for the trash man, and playing with all our neat little toys and gizmos. SOME of us will be curled up next to the fire with our brand new copy of "Neptune Bound," and wishing we had a 1954 Dano-made maroon leatherette-covered lightning-bolt logo'd Silvertone. I've had a lot of guitar books in my life; still have most of 'em... "American Guitars," "Guitars from Renaissance to Rock," "Gibson Electrics," "The Fender Stratocaster," "50s Cool: Kay Guitars," "Guitars from Neptune (of course)" and dozens of other guitar (and other instruments) books that have fed my desire to know about these wonderful, portable, influential music makers. Now, there's "Neptune Bound." I just got my copy, y'all, and it is INCREDIBLE! An introduction and personal history from Nathan Daniel's son, Howard, 400+ pages of every model, prototypes, Dano factory shots, Vinnie Bell, Silvertones, Danelectro patents, catalog reprints, ads, schematics... everything you could hope for in a book like this! Get one for a stocking stuffer! They'll go great on your coffee table, in your practice room, in the studio, in the library. A truly astounding work! 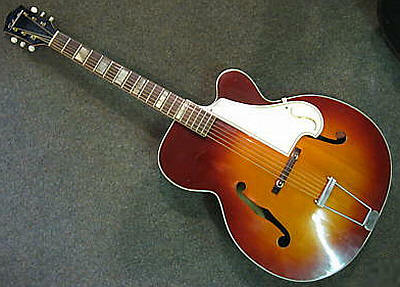 Let's get Friday going with a seldom-seen guitar from the mid-50s era, the 1352. It's based on the Harmony H61, and this one is mighty nice. See the cord keeper? It isn't even yellow! Look how clean that headstock and footswitch is! Starting the day of Thor off with a super-rare amp in case and lap steel combo from the 40s! 1485 Dano Tube Amp with speaker cabinet VG $1250 Original owner, trem/rev work, very clean, casters present, manual, footswitch, catalog as incl. Flower Power to the max! Aliens too! Gotta show you this 1444 bass, done up in well, I don't know WHAT style to call it... ironic-retro-Americana? Will that cover the Alien, the flowers and the stars? I like how they centered one of the flowers on the output jack. Owned by children's artist Corey Leland. You can see the bass in the background of this YouTube video. 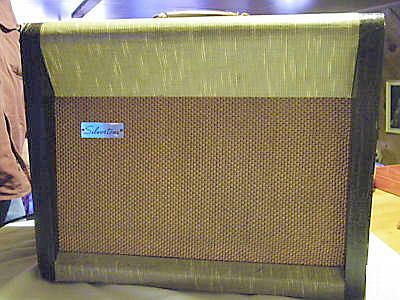 1422 Sears tube amp G $244 Grille tears, footswitch incl. 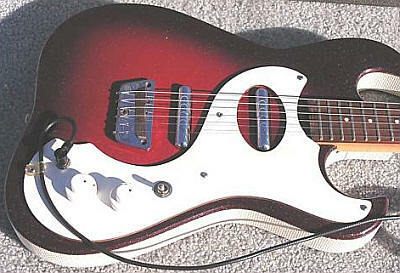 I suspect this late-model amp to be Danelectro-made, it is nearly identical to the DM-25. The 1422s changed mid-life into solid state machines. 1316 FTAC F $39 This is the only example of this guitar I've ever seen: yellow Silvertone logo also seen on early-mid 50s 605 acoustics (I suspect these 1316s were made from 605s that just didn't have a soundhole cut out), and a pickup assembly that could have been sub-contracted from Danelectro; it looks so much like the vacu-form pickup of the 1375/77 models: , the missing knob looks (in catalog illustrations) a lot like the Dano 'cupcakes' knobs that they used on the 1375/77. Here's the first catalog listing for Sears "Lowest Priced Electric Guitar"
Interestingly, this guitar became available the catalog after the Dano 1375/77 models went away. 1459 Dano Tube Amp VG $405 Clean, light wear, back panel in place, recently serviced, NOS tubes added, handle worn, snag at very top of grille on edge of speaker depression. The link refers to the 60s era 1459 amp, but there is a note on that page about this amp and its relation to the 1432. 1838 Oscar Schmidt Autoharp w/ OC VG $103 15-chord, no tuner, 3 picks incl. UNK Teisco HBEG VG $300 BIN Strange one; it's got the triangular control panel and other features of a 1418, but the 'mustache' shaped headstock of a 1455 (while retaining the natural finish and blue logo tag of the 1418) and the pointy horns of neither. Incredibly, the November numbers were nearly identical to October this year! I tracked 258 items in November, and they sold for a total of $69,270! That's only 3 items less and $98 more than the October numbers! Here's some highlights of what changed hands: (43) 1448 guitars/amps or one or the other ( a Silvertoneworld record! ), (11) 1457s, (21) 1484 amps, (13) 1482 amps, (7) 1481 amps, (6) 1483 amps, (6) 615 guitars, (5) 'Jimmy Reed' 1381 guitars, and (5) 1446 'Chris Isaak' model guitars in the bunch. 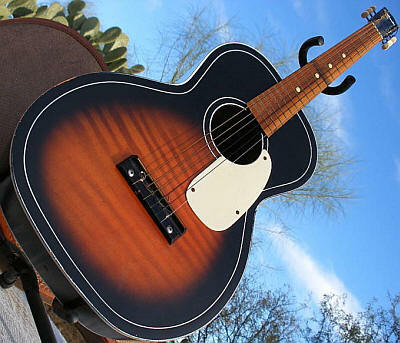 The highest dollar item went to charity with a Wilco-signed 604 model that sold for $1526, the highest dollar amount for a 'regular' item was $1150 for a 1446 'Chris Isaak' model guitar, and the least amount brought was $1 for a very poor condition 615. Let's see if we have a few more auctions close today. Yesterday was about the slackest day in memory, as far as Silvertone auctions are concerned. 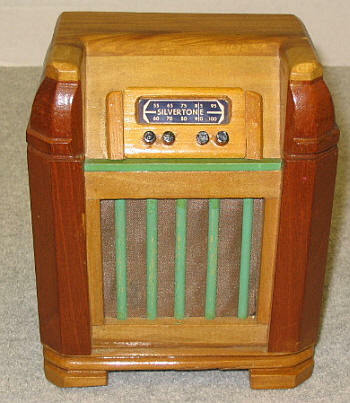 We did have that cool radio bank, so we have that going for us. Oh, yeah... it's a bank! The money slot is concealed behind the tuner window. 700 Harmony FHAC G $103 Picking wear under strings, back bottom repaired , strap button missing, deco logo , original 'strap' cord incl. 2574 Oscar Schmidt Autoharp w/ OC E $163 Very clean, everything incl., books, records, picking charts, even a felt pick! Gimme a day or two to tally up November... it's a busy time of year!